New & Improved!! Sunless tanners know that the first part of our tan that fades is our face. This is a result of the strong products we use on our faces daily. 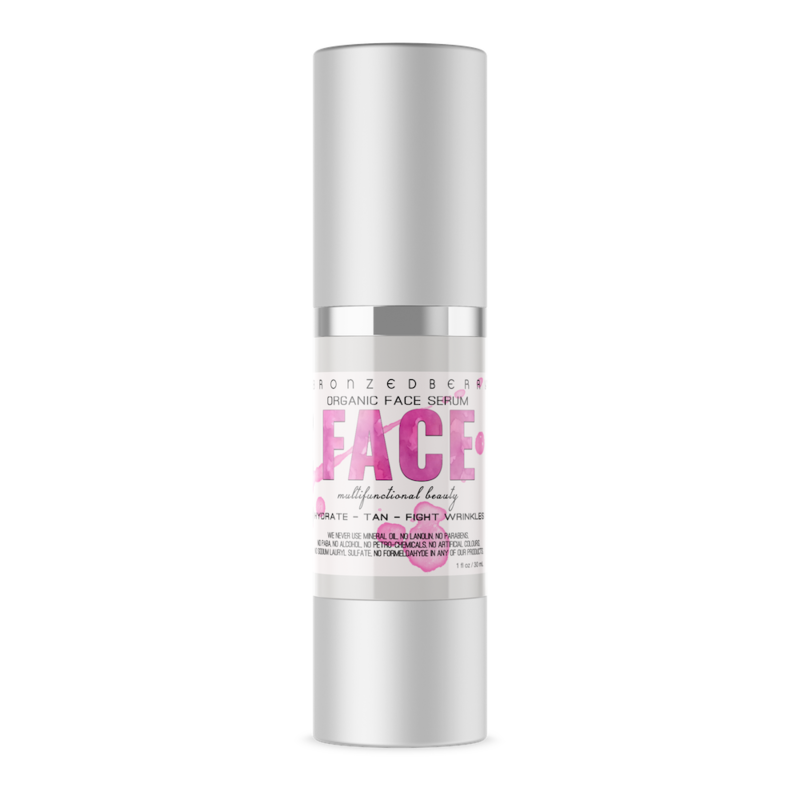 If you want to keep that summer glow without the wrinkles, try our Face tanner. It is infused with anti-wrinkle fighting Horse Chestnuts, proven in clinical trials to prevent and decrease wrinkles. Our non-comedogenic formula won’t clog your pores. Each ingredient is hand picked and has European approval from organizations like COSMOS and ECOCERT. Directions: This is a night time treatment. After you wash your face apply this luxurious cream to your face and neck. This will replace your nightly moisturizing treatment! Keep a light glow with thin layer on your face or neck or go darker by applying two coats. Either way you will wake up refreshed and tanned. Wash hands after application. Not only is this a self tanner it smells good enough to eat, and bonus anti-aging properties! Face is one of my absolute favorite products. I use it in the evening and when I wake in the morning I have a light glow, evening out my skin tone so I don’t have to use foundation regularly. I love it! I just love seeing posts from my beautiful clients that love our products just as much as I do! Not only can I knock years off my skin I can also keep it sun kissed!!! Those two things alone make this the best on the market. The way it smells happens to be a plus AND the consistency is perfect as well. Hands down the Perfect product to use all year long! I haven’t worn foundation all summer long thanks to this little gem! Lengthens my spray tan on my face! It’s amazing! I use FACE in the evening as a moisturizer. I love waking up to a beautiful, moisturized glow. I also love the way my skin feels so soft. On days that I forget to use it, I feel so different in the mornings and miss the glow. It’s such a gentle, subtle natural looking appearance on the skin. You will love it!! This is especially great if you’re like me and running late most mornings. My face is tan (best part is I can control how tan it is), and I don’t need to worry about spending too much time applying makeup…because there’s no need to! So really it’s a win-win-win. Your face will be tan and moisturized, you save precious time getting ready in the morning, and you save money on makeup. ?? This is such an easy thing to do to help your face look naturally tan! You can actually see a difference and it makes your makeup look even more flawless. It is one of my must haves! I use this every other day and it keeps my face glowing. The smell is amazing. If you want your face to have a glow, put some FACE on the night before and it shows the next day! I love having a tanned face but don’t love the way the sun damages my skin…this product allows for a healthy glow without the harmful rays. I don’t have to even wear makeup…well, except for some mascara. Highly recommend.